Stopped in while family was out in NYC. Pretty small subterranean space but adds to the vibe and appeal. Selection was fairly small yet very diverse and well thought out. Service was off the charts good and beet related discussion was fantastic. I used to frequent this little dive craft beer bar since St. Marks is one of my favorite areas in NYC. However, I was unfortunate enough to attend the New Year's Event here one time and I can say with confidence, I'll never go back. Possibly the worst beer-related experience of my life. Atmosphere here is usually pretty good. Its down in a basement and pretty divey but for people who want a nice, quiet, out-of-the-way place to enjoy a decent beer, its more than serviceable. Quality is decent. Beer is served at the correct temperatures though it seems like the pour size dictates the glassware type, not the beer style so keep that in mind if you're a stickler for such things. Overall though, nothing to complain about. Service is pretty much who can stuff money in front of bartender first. Reminds me of a saloon in the wild west. If you find yourself at the end of the bar, prepare to be "that guy" or else be SOL. At the New Year's event, the bartender that was taking care of us had no clue about the beer she was serving though she was nice enough. What was irritating was that the event stated there would be "special" beers served. When we got there, all there was, was flowing beer from the regular taps and about 3, 3 ounce pours from cheap self beers such as Maine Zoe, De Dolle Export Stout, and another off-the-shelf beer I can't remember. That wouldn't have been so bad except for the fact that the owner himself, Jimmy Carbone, was sitting at a table with a bunch of his female friends pulling out bottle after bottle of Drie Fonteinen and Cantillon for the table. What the heck? The whole night I wondered why the real "special" beers were only reserved for people the owner knew. And if all that wasn't enough, the "Champagne Toast" that was supposed to come at mindnight.... well... never came. No one came around to pour the champagne before the ball drop and I left absolutely disgusted that I had chosen to spend New Year's here. Food is decent but super overpriced and the portions are unimpressive. Pretty par for the course for a NYC bar though. Jimmy's 43 is, overall a pretty run-of-the-mill craft beer bar that serves just enough taps and has just enough bottles to call itself a dedicated craft bar. The tap selection is never impressive and the bottles are way, way overpriced ($50 for Parabola, $65 for Black Ops). Also, keep in mind that you should never, ever go there for a special event unless you're lucky enough to know the owner or else you're in for a real rip-off. A small rathskeller-esque eatery in NoHo with a fun tap selection and decent food selection. I don't get much of a chance to visit NYC, so I was excited when a recent business trip had me staying in the City. Since I only had one night, and I wanted someplace that was different. Since this place came highly rated by BA and NYMag.com, it sounded like the perfect place. The atmosphere is a definite throwback, with a basement bar/rathskeller feel. Very small with limited seating. I would imagine the place could easily fill up, although there were still a few table tops available on the Wednesday night I was there. While the beer selection wasn't big, it was very admirable. Rotating taps every day or so along with a medium-small sized bottle selection (everyday + specialty list). Draft prices were fine, but the bottles seemed a bit on the high side (particularly for the more unusual stuff). Having arrived there close to the time the kitchen opened, there was some confusion over what all was available for beer and food (the menus for the day were ready about 15 minutes after I arrived). The attentive service made up for this minor inconvenience. Food consisted of small plates and I had a chance to sample about 2/3 of what was made. Everything was well prepared, good but not great. With so many great places in NYC, it's hard to say that I'd make an effort to return. If, however, I was in the area and I was looking for a decent beer, I'd certainly be back. Jimmy's is down in the basement and you could easily walk by it without even noticing it. The place is dark and a little run down on the inside but I did not come with high expectations on the decor. I have to say this place had one of the grossest bathrooms I have encountered - kind of reminded me of the one in Trainspotting. I think the selection of beers here is usually pretty good but was excellent because they had a brewery beer dinner the evening before so a lot of those beers were available as well at brunch time. Beers were well poured and served in appropriate glassware though perhaps a little on the cold side. The food is quite good at brunch time and we enjoyed what we ordered. Service was good, waitstaff was attentive and we were well looked after with prompt delivery of our food and beverages by friendly folks. After visiting McSorley's, I walked down on Seventh Street looking for Jimmy's. I missed it! Looked around and back and saw the sign. Who would have thought? This joint is in a basement! Sort of those "hidden" speakeasies that proliferate in the East Village. Unlike McSorley's, Jimmy's was totally empty when I visited on a Monday at 3:30 pm. Hipster-ish bartender (beard and beret on tow) was friendly but reserved. I inspected their 11 taps and was not impressed. Lots of locals and regionals (Bronx Pale Ale, Crossroads, Barrier, Wandering Star) and Sierra Celebration, Pretty Things, Nickel Brook Headstack IPA out of Cali. OK, but boring, and too heavy on the IPA's. No variety, everything under 6.0%. Hopefully this is not always the case? Small and pricey bottle menu, with a lot of European beer (Harviestoun, Ridgeway, Nogne) and 4 vintage beers. Some good ciders too, like the Basque Isastegi. It is cash only, which I don't like. Their food menu (didn't try because it is not served untl 5:30 pm) is small but appealing, with a focus on local ingredients. They have beer events and dinners, which is always a cool thing. The best thing about Jimmy's is the ambience. Cave-like, cozy, warm, with nooks and crannies to explore and great music to boot (Whiskeytown, a band to remember). Reminded me of the bar downstairs at Brewer's Art in Baltimore. Very relaxed overall, although I'm sure it can get crazy and loud at night. Prices were fair- $6 for most pints, one dollar more for 20-oz imperial servings. Of the three neighboring beer bars in the Lower East Side--along with Standings and Burp Castle--I think I like this one the best. Located directly underneath Standings, Jimmy's has a nice beer-lover's atmosphere and serves a good selection of beer, with 10 taps, a cask, some bottles. Limited menu--mainly apps and price fixe--but it's still something, as opposed to the other two places which don't serve food regularly. Still, the food I had wasn't really anything special: sausage appetizer was basically a $7 pizza topping. Staff is ok, friendly but a bit unattentive. We found ourselves to have a bit of extra time before the show we were in the city to see, was to start, so we ventured here for a pre-performance brew. Located on a quiet street in downtown Manhattan, Jimmy's No. 43 is a small space situated below street level. You descend to the bar on a grated staircase. As you walk down you pass large pane windows, allowing for dim peeks into the space. You enter into the bar area, with the bar itself directly in front of you, and a small seating area off to the right. There is a back area as well, with a second bar that was seemingly used for storage purposes. The bar seating is minimal, with only about seven seats. The countertop is a clean, light colored marble, and the stools, seats, and tables, are of an old fashioned wood design. The lighting is low, with the space lit primarily by low hanging stained glass lantern types, with a few table lamps around the bar. The overall effect is this warm, orange glow that permeates to the dark corners of the room. The walls are hung with stag antlers, photos, and portrait paintings, possessing a pleasing, amateur quality. There are also some smudged (in a non-offensive way) mirrors hanging around, which give off this "creepy" or 'haunted" vibe. The bar's backing was decorated with a variety of ceiling-hung glassware. The very top of the walls, going all the way around the room, is studded with oak barrels, set deep into the wall. While we didn't sample the food, the menu looked a bit small. The offerings, however, seem upscale, with an emphasis on German and Italian ingredients. There are also boasts of local ingredients, including New York state oysters and cheeses. Many of the "plates" are cooked with some type of beer, naturally. We did get free pretzels with our drinks. Anyone hungry should be able to find something tasty to complement their drink selection. After looking over the beer menu, and chatting with the bartender, we were each served a glass of Avery's Old Jubilation. This and eleven other beers were on tap. They had roughly twice that number in bottles. The selection was heavily German and other Europeans (including a Finnish beer!). Of the American selections, the favor was to west coast micros, with the likes of Lagunitas, Green Flash, Stone, and Bear Republic. There was also a "Vintage Bottle" selection, but the prices were more than enough for us to avoid it for the evening. For the non-beer drinkers, they also have a standard wine selection. Overall, this was a nice place to stop in and have a drink. The atmosphere is cozy, feeling more like a friend's old basement than a bar. The staff is nice enough, and the bartender seemed knowledgeable. For the nice selection of beer they have, it wasn't that crowded for a Saturday night, and the crowd there was reasonably quiet, as you could hear the 70's and 80's music station playing over them. One thing we were surprised by was the fact that it is a cash bar only, so be sure to hit the ATM before heading down here. Ultimately, it seems like a perfect place to go with some buddies for a casual evening, or with a beer-appreciating date or significant other before a show. It's the first place I tell people to go whenever they visit New York City. An amazing selection at prices that everyone can appreciate, this gem in the heart of Greenwich Village is everything a bar should hope for. Intimate, Intellectually stimulating and Unpretentious, it's perfect for experts to be introduced to new favorites and casual drinkers to become enthusiasts. I've spent the majority of my time there drinking, but what I've had of the food has been stellar. I rate the food as exceptional as well because, as a Midwesterner, the grits at Jimmy's are the only thing even close to the high level of quality I've experienced at home. On long nights there with friends, the bartenders and waitstaff not only help set the friendly atmosphere, but are knowledgeable enough to always suggest the perfect new beer for us to sample. It's everything you could want from a bar in safe environment. Highly recommended. Incredibly disappointed with my experience here. Went for the event with Chuck Silva during NYCBW. Sat down to eat first and the service was terrible and the food was ok, but I expected better from reviews I've read about the place. It took a whole hour for me to get my steak entree, to find my potato puree replaced by poorly done potato chips. As far as beer, the servers didn't seem knowledgeable and the bartender poured the wrong beer for me twice. The night was saved by the event with Chuck, which was fantastic to have that kind of conversation with a brewmaster. It is a basement bar in New York City right near St. Mark`s Place. 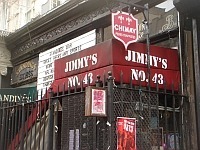 Stepping out from the hot sun into a dimly light bar was quite a change, but the overall atmosphere at Jimmy`s No.43 is fairly pleasant, with a good mix of patrons of all ages and backgrounds. Service is very good here from a knowledgeable staff. The selection includes a cask in addition to about 9 other taps. It was about 70% american craft beers and 30% smaller european taps. I went for the Green Flash cask IPA, great beer by the way. I met some cool people here and had a fun time, will be back. First time I went to Jimmy's was right after I turned 21. I got Young's Double Chocolate on draft and ended up on a stout kick for the next two weeks. Jimmy's is also host to the NYC DAT's beer tastings. I made it to their beer, cheese, and chocolate one. It was extremely educational and the pairings were excellent. Back to Jimmy's: the atmosphere is great. The bar isn't too big, but they have larger section with tables and a nice space to rent out in the back. The selection changes, but it's always superb. The staff is pretty great and the prices are good. On Halloween night I was invited to a bar to let my inhibitions go and partake in NYC Halloween chaos. I found myself in a private party, dodging a burlesque belly dancer's fireball, while getting my pockets stuffed with condoms by adolescent girls dressed as fairy tale characters. This was my introduction to Jimmy's No. 43. I recently stopped by again by chance and was remarkably impressed. The atmosphere was quiet, serene, and cozy. I felt so at home, almost inebriated by the space. The inebriation increased when I dove into a goblet of Sixpoint's Gorilla Stout. The pasta I ordered was incredible, and I couldnt stop stealing the little potatoes from my girlfriend's plate. I thought to myself...this place is badass, and that was before I made friends with the staff and laughed through a conversation accompanied by a pint of Magic Hat Lucky Kat. All I know is...I'm going again, and telling people this place is something to check out. Food:Great, Selection:Good, Staff:Friendly, Decor:Awesome. The place is as memorable to me as that night of debauchery, and doesn't even need Lil Bo Peep or Red Riding Hood to keep a smile on my face. I have been by this place a bunch of times and I dont know how I missed it. Anyway, it is a sub-terranean place --you walk down some narrow winding stairs and enter. Once you enter, the bar is kind of off to the left and it has a real cool atmosphere. The architecture in here is nice also as it has vaulted brick ceilings with lots of little nooks and small rooms around the corners of the place. The beer and overall drink selection on everything in here is very well thought out and these guys are into offering stuff that is hard to find. I got a Christoffel blond which I had never heard of or seen before. It is a Belgian pilsener which I didnt even realize was a style that the Belgians made. It definitely had some gold malty characteristics that youd associate with a Pilsener but it clearly had that vinous Belgian aspect involved as well. It was quite good and they mention that they are the only bar in NYC that has it available on tap. For a current listing of what they have available I'd recommend referring to their website which looks like it is updated with some regularity. Service was friendly and attentive and prices were kind of typical NYC. Kind of expensive but not so high that you wouldnt go here. Overall, I loved this place and definitely will be returning. Stopped in after dinner last night. As others have said, the place is cozy but not cramped. Lively crowd and lots of people coming in for the movie in the back. But it was never too loud for conversation nor too crowded to move about easily. We got a seat at the bar immediately. One thing I loved to see: They poured a lot of high end beer. Lots of beer bars have two dozen micros on tap but 90% of what they serve is macro. The result is slow-moving kegs and old casks. Jimmy's moves a lot of the good stuff. No off-flavors from dirty lines or old kegs. The bartender was attentive and knowledgeable. Everything was served in the more or less the right glassware. She did push a rye pale ale on my friend, but I think that was because the manager was hovering and he wanted her to. As soon as he got busy elsewhere, she stopped pushing it. Otherwise, service was great. My one gripe is really my own pet peeve: something was badly unbalanced in the taps right in front of us and all the beers were coming out 80% foam. The bartender ended up dumping as much as she poured trying to get full glasses. Not only are we paying for all that wasted beer (although prices were not bad), but it just seems like a lack of respect. Some of that stuff had been lovingly brewed in Belgium and carted all the way here only to be dumped down the drain. That's not right. If I go back, I'm going to suggest they get their system balanced. Otherwise, a very enjoyable place. If I lived in Manhattan, this would be a regular spot. I visited this underground bar for the first time last night and found it to be one of the mostly welcoming and comfortable places I had been to outside of the National Arts. My friends and I relaxed and drank from the menu that was presented while great aromas emanated from the kitchen in the back of the place. The waitress was interesting as she seemed to vanish and reappear with a smile while we were discussing the highlights of our bar hopping that day. I didn't spend a lot of time evaluating the place as I knew after 5 minutes that it was easily one of the most welcoming I had been to.